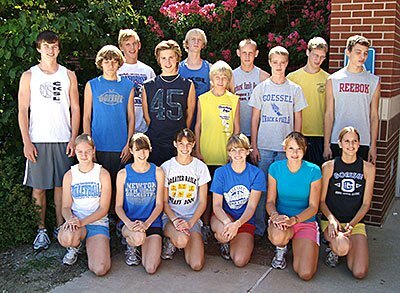 Goessel High School will hit the cross-country scene this fall with a deep squad of 16 runners. 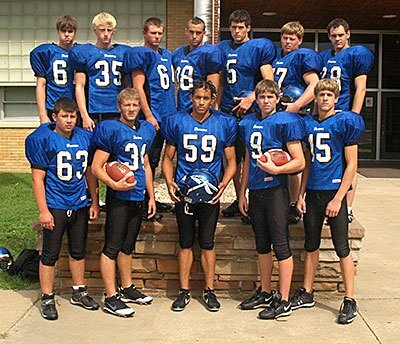 Pictured are: back row (from left), Carl Hylten, Derek Kruger, Chad Wedel, Anthony Esau; middle row, Isaac Fast, Laird Goertzen, Lars Osland, Stephan Goertzen, Austin Unruh, Jared Reimer; front row, Lindsey Wedel, Sara Boman, Kristen Hoffman, Shanna Klassen, Mareike Joppien, Raney Schroeder. Five seniors will lead the way for Goessel football coach Justin Coup this fall. Pictured are: (from left) Travis Fensky, Niko Herman, Austin Unruh, Kendall Voth, Craig Banman. Nathan Walker is not pictured. The Centre Cougars are seeking to build on their 13-15 record of a year ago. Pictured are: front row (from left), D.J. Turner, Carlye Simons, Leann Pankratz, Bridgette Burns, Shelby Deines and Allison Shields; back row, Kseniya Vynohradova, Theo Kassebaum, Amanda Floyd, Tori Schill, Katie Remy and Cassandra Dones. The Centre football team is out to improve on its winless season in 2007. Pictured are: front row (from left), Canh Antoszyk, Savik Howard, Josh Olson, Brandon Albrecht, Josh Leach, Ben Krause, Adam Kristek, Nathan Barney; second row, Zach Antoszyk, Trevor Troutt, Seth Stroda, Jacob Jennings, Alex Hajek, Quentin Wacker, Adam Matz, manager; third row, Jacob Jirak, Rustyn Kerbs, Casey Kristek, Cole Svoboda, Benjamin Wirtz, Tanner Brunner, Ben Baker; back row, Shane Methvin, Kordell Harding and Trevor Hageberg. Not pictured:? Brian Burhoop and Chase Spindler. The Peabody-Burns volleyball team has eight returning seniors and letter-winners. They helped the Warriors go 4-1 in their season-opening tournament Aug. 30. Pictured are: back row (from left), Felecia Pohlman, Danielle Savage, Julie Wedel, Kaitlyn Preheim; middle row, Michaela Methvin, Embry Hodges; front row, Bayleigh Clark, Clarissa Terronez, Alex McDowell. 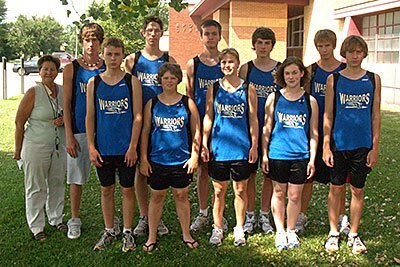 The 2008 Peabody-Burns cross-country team: back row (from left),? coach Kim Topham, senior Jake Middleton, senior Seth Methvin, junior Josh Klarmann, junior Chris Schafer,? junior Aaron Topham; front row, senior Kendall Wiebe, sophomore Heather Brooks, sophomore Lauren Pickens, freshman Amanda Pickens, and sophomore Sheldon Wiebe. Not pictured: junior Curtis Frederick. The returning seniors and letter-winners that the Peabody-Burns football team will turn to for leadership this season are: back row (from left), Chris Dunfield, Brian Wingert, Tyler Slater, Elliott Spechtenhauser, Brandon Pickens,? Chris Brooks, and Henry Hammann; front row, Justin Fistler,?? Daniel Brassfield, Isaac Hilliard, Sean Jones, and Jacob Simmonds. 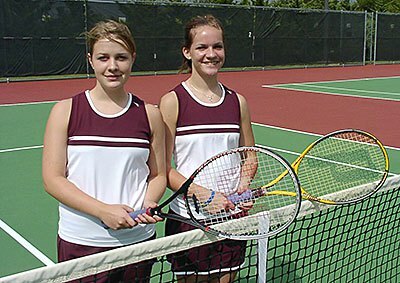 The HHS tennis team returns only two letter-winners after the graduation of eight seniors from last year?s team. Senior Kelsey Bartel (left) and sophomore Becky Faber will lead a young and relatively inexperienced team this fall for first-year head coach Bob Woelk. 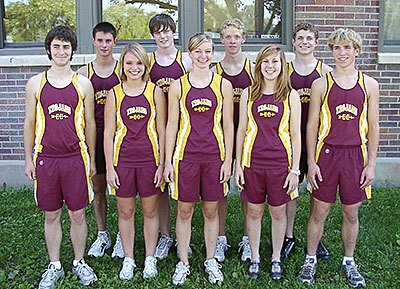 The Trojan cross-country team returns nine letter-winners from a year ago: (from left) Cody BlackKetter, Matthew Klenda, Clara Ens, David Ratzloff, Heidi Schroeder, Brandon McMillen, Jessica Elliott, Nathan Vogel, Nicholas Mueller. 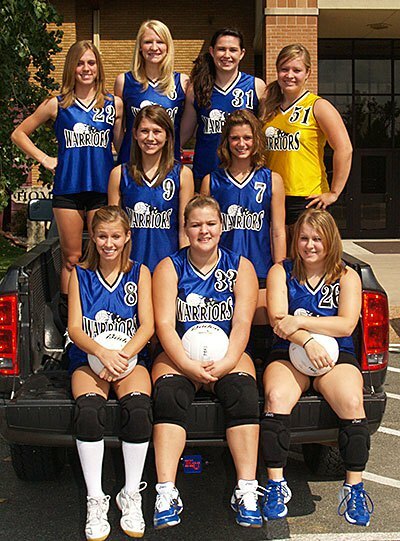 Coach Sandy Arnold will form the foundation of her 2008 volleyball team with six seniors and letter-winners. Pictured from left are Jet Skiles, Candace Weinbrenner, Dakota Kaufman, Kassidi Luthi, Tiffany Rooker and Cassie Kroeker.